Former U.S. Open champion Samantha Stosur has turned to Andy Murray's former coach Miles Maclagan to help reverse her slide down the world rankings, Tennis Australia said on Thursday. The 29-year-old Australian, who has dropped to 18th in the world from fourth in 2011, failed to get beyond the third round at any of the year's Grand Slams and split with her long-time coach David Taylor shortly before this year's U.S. Open. 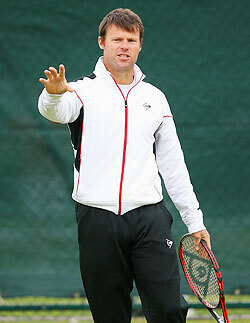 Briton Maclagan joined Murray's camp in 2007 and helped the Scot develop into a grand slam contender before parting ways in 2010. He recently split with British women's number Laura Robson after a four-month stint. After the hard-hitting Queenslander made the semi-finals at Roland Garros in 2009 she broke through for her maiden grand slam title at Flushing Meadows when she humbled Serena Williams in the 2011 final. However, she has struggled for consistency since and plunged to her lowest ranking in three years after being dumped out of the first round of this year's U.S. Open by a qualifier.